Wahama’s Colton Arrington (left) signals safe as Point Pleasant’s Carter Smith shows possession of the baseball during the Big Blacks’ 16-4 victory on Thursday night in Mason, W.Va.
Point Pleasant’s Lane Rollins (24) and Thomas Mayes (15) score during the Big Blacks’ 16-4 victory on Thursday night in Mason, W.Va.
MASON, W. Va. — Runs and errors often go hand in hand. 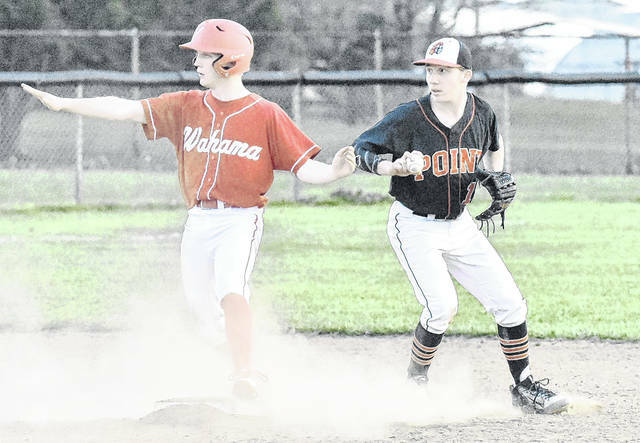 The Point Pleasant baseball team scored 10 runs in the sixth inning en route to a 16-4 victory, as host Wahama committed nine errors in a non-conference contest between Mason County programs on Thursday night at Claflin Stadium. PPHS (6-5) leaped to a 5-0 lead through two innings of play, but the White Falcons (5-2) cut the deficit to 5-1 in the bottom of the third frame. The Red and Black extended it’s lead to 6-1 in the top of the fifth, however in the bottom half of the inning Wahama again chipped into the difference by adding two runs of their own to narrow the margin to 6-3. Point Pleasant’s offense came alive in the sixth, as they chased WHS starter David Hendrick from the mound after six innings of work having allowed six runs and feasted on White Falcon relief pitching to extend the advantage to 16-3. Wahama tacked on a run in the bottom of the sixth, but PPHS allowed no further damage and closed out the 12-point victory. 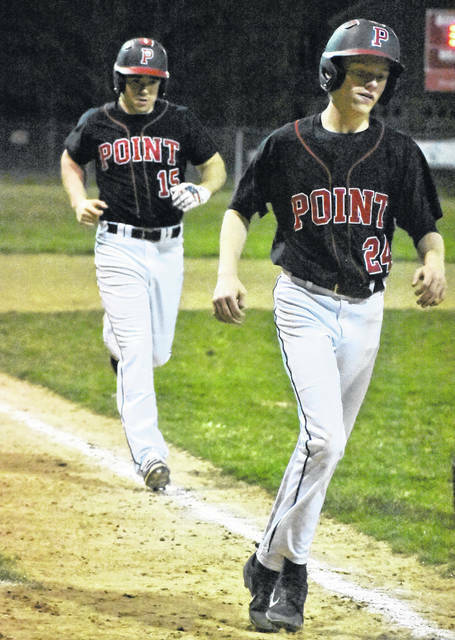 Miles Williams and Carter Smith led the way for Point Pleasant with three hits, as Thomas Mayes followed with two safeties, including a two-run home run in the sixth inning. Smith and Mayes also finished with five RBI apiece. Joel Beattie, Brody Jeffers, Kyelar Morrow and Alec Smith closed out the hit totals for PPHS with one hit each, respectively. Beattie, Jeffers and Sam Pinkerton also provided one RBI each in the contest. Mike Williams earned the pitching victory, as he provided five innings of work and surrendered three runs on eight hits, with three walks and three strikeouts. David Hendrick suffered the loss for Wahama, as he surrendered six runs on six hits, with four walks and striking out three hitters. Antonio Servicz provided ⅔ innings of relief and allowed eight runs on six hits. Tyler Bumgarner also had ⅓ innings of work and allowed two runs on two hits. Hendrick and Tanner Smith led the White Falcons with two hits apiece. Dalton Kearns, Colton Arrington, Anthony Ortiz, Bumgarner and Serevicz each finished with one safety each. Ortiz also had two RBI in the contest, as Tanner Smith drove in one run to conclude the offensive totals for Wahama. Following the game, Point Pleasant head coach Andrew Blain was pleased with his team’s performance — particularly with their focus and intensity. In contrast, WHS head coach Billy Zuspan viewed the setback as a matter of his team making too many mistakes against a quality baseball team. “Point Pleasant is a good baseball team,” said Zuspan. “They are well-coached. We lost to a quality team tonight. It was a setback, but I felt like we made some mistakes through the course of the game that you can’t make against a good team because they will capitalize on them.